Still Monday, September 21, 2015. The highlight of my downhill slide into Soto de Luiñes is meeting three young people who are ready to pass me on the trail. A blond, adorable young man, and two young woman, one with light brown hair, a quiet person, and the other, that red dye that is almost magenta, and she is quite vivacious. They seem fairly energized even during this endless walk (hey, they were young), and I ask what they thought of this “walk”, whether they forked left at the church, where they had started the Camino, where they started today . . . the usual questions we all ask one another. We talk for awhile as we walk, and they go on. Of course they do. I’m not a tortoise, I’m a snail. I reserved two rooms the other day, one for Ria and one for me. At 12 Euro per person (shared bath with others), it’s worth getting a room by myself. Ria agrees, though we have shared rooms when they are 30-40 Euro. But when the albergue rate is 10-15 Euro, I’d rather have a single or twin-bedded room. And when the albergue rate is 5 Euro, I feel WAY too old to stay there. So we are deciding to get our own rooms when they are affordable. This is a perfect time to pass on the albergue on the other side of this town. When I get to the Hostal Paulino, a sign directs me to go next door to the reception desk in the regular hotel. I ask whether my friend has arrived. The woman says, “Oh, yes, about three hours ago.” Hmmm. Of course, says the snail. I go back to the other building, put all my belongings in Room #1 and walk to the far end of the hallway to #9 to knock on Ria’s door. She opens it with surprise and relief. I say I will tell her about my missed direction later. Now I need a shower, and I can hardly walk on my feet. Hobbling has not ended yet today. After an hour or so, we agree to walk up the street to the only real restaurant in town. Remember that the bars and cafes only serve coffee, drinks, tapas or pinxos, some form of breakfast with no eggs, and “raciones”, (appetizers), (bocadillos). But no real dinner. And real dinner isn’t served until at least 8:00 in most restaurants. My sentiments exactly. We eat, talk, pay our bill, say goodbye to the young trio, and walk back to our rooms. I think those three are staying at this hotel. They can split the room and the cost among them easily. I decide to stay an extra day, let my feet and ankles rest, and try to write a bit, sleep in, get ready for the next week of walking. Ria will walk to Luarca. 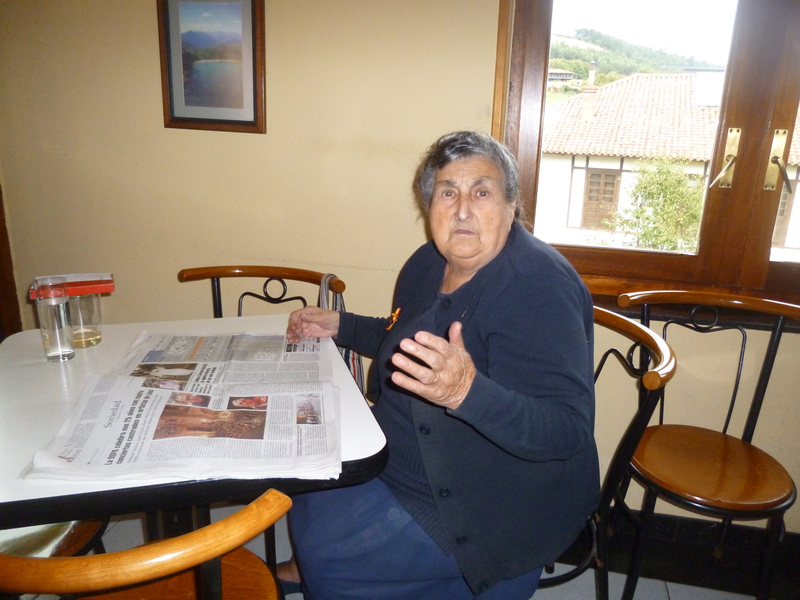 I will take the bus to Luarca on Wednesday and catch up with her. We plan to stay in the Albergue right in town in Luarca, two days from now. I can’t sleep that night. One of those nights I know so well at home. But now some of it is because my feet ache, my ankles ache, my knees ache, and in dismay I see that my hip-sockets are also on the list of achy-breaky body parts. Every hour or so, I look at the time on my phone. I still can’t sleep, and know this doesn’t bode well for tomorrow. And every time I get up in the middle of the night for my now-frequent bathroom trips, it takes me awhile to get steady on my feet. Tuesday, September 22, 2015. In the morning I am exhausted. Ria knocks on my door to say goodbye and to confirm our plans for two days from now. I putz around in the room for a few hours, still hobbling, until one of the owner-family members comes to my door, wanting to clean the room. I walk over to “Reception” to tell the receptionist I will stay another night, and then I head for the bar up the road with my computer, to work on some of the last few days. Coffee con leche, of course, and a croissant make up my breakfast. Sadly, no eggs anywhere in sight. An old woman sits at the next table, reading the newspaper, cackling to herself as her fellow village people come in and out of the bar. Intermittently she goes up to a slot machine in the corner, puts in a coin or two, and I hear the payout . . . incredible. She cackles again. A man standing next to her shakes his head, looks at me, says something in Spanish, and shakes his head again. I can’ answer her, but just want to know she has no objection. She can be as puzzled as she wants to be, but I just want her permission. She shrugs again. 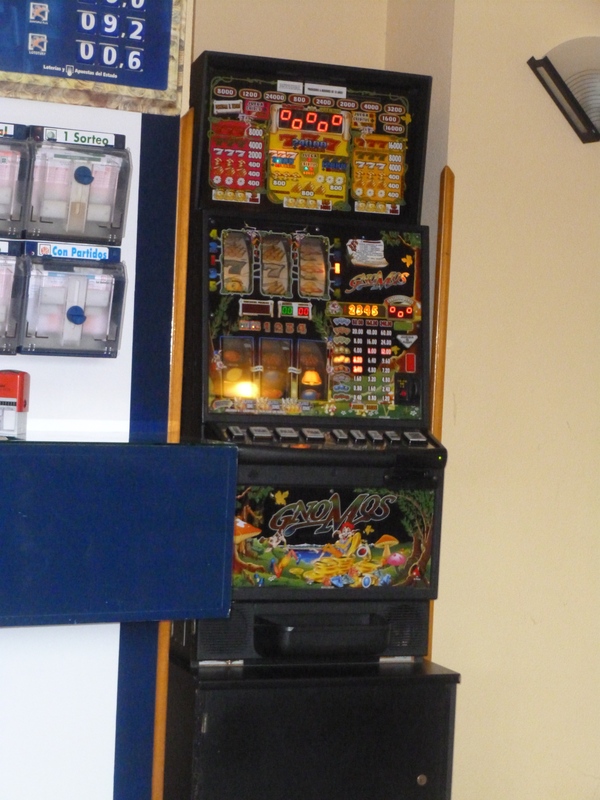 And this slot machine is her plaything . . . I decide to go farther into town, get some cash, visit the pharmacia and buy a banana. As I come to the grocery store, I literally run into Larry, who has come from somewhere, Avilés, I imagine. He’s staying at the hotel where we ate dinner last night. We talk for a bit, he takes off for a walk around the town, and I go to the hotel restaurant to get a salad for lunch. Larry joins me with a glass of wine in his hand, and I, everyone’s travel agent, get him a plane ticket from Santiago to Madrid for early October. This is such a different Camino experience for me, and he talks about it, too. We will have more conversations like these, with one another and others as well, over the next days and weeks. And I have to think more about how it is different and what that means, but my impressions have been quick to come but slow to develop this time. I realize that I don’t have those free-flowing days, where the thoughts float in and out in the way they did on the Camino Frances walk. More like intense concentration on where I put my feet with every step, regrouping my energy after a coughing bout, as well as enjoying the company of some of the people I have written about in the past few weeks. The views on sunny days are often spectacular, for at least some part of each day’s walk, and there is always a cow, a dog, a cat, sheep, birdsong, some live thing that makes me glad to be among the creatures of the earth. Now I want to go back to my room and rest a bit, write more, and begin to get things packed up for leaving tomorrow. The bus to Luarca doesn’t come until early afternoon, so I will have a half day to continue my writing work before I begin again with the walking work. I feel sluggish and that’s not a good thing when you are walking across a country, no matter whether you augment with buses or not. I need to give myself a good talking to. It’s a gloomy day, threatening to rain, and perhaps that affects my mood as well. No sleep last night didn’t help. Tonight I will eat the dinner at my hotel, and the manager tells me I can have two “starters” rather than a starter and a main. I see a lentil soup and pasta bolonese on the menu and perhaps a good warm meal will help bring on some sleep tonight. I will wish myself a Buen Camino for tomorrow, no matter what that will look like, and will crawl into bed, a fleece blanket wrapped around me. This entry was posted in Camino de Santiago, Camino del Norte, Eucalyptus trees and tagged Camino del Norte, new young friends Camino de Santiago, Soto de Luines. Bookmark the permalink. Buen Camino, Meg! Are you doing the Norte or the Frances? Have you done a Camino in the past? Safe travels, By the time you leave on October 3, I will be nearly done with the Norte. I am a new reader who just discovered your first blog after reading about you in the Coloradoan. It’s so wonderful to read about the journey of someone who lives in our town. Having devoured the account of your first Camino in two days, I am now enjoying a slow read as you post in real time. We walked a long distance trail in Scotland a few years ago, which gives me some idea of what you are feeling on these days which seem endless. I lost a toenail in the process. As my husband says often says, there will be brighter days ahead! Coincidentally, you and I are about one month apart in age, so I really feel your aches and pains. I wish you a buen camino. Sorry I didn’t reply earlier, Ellen, and am very happy you are enjoying both my first Camino and this one. Almost finished with writing the trip . . . then it will take a bit to gather up some of my afterthoughts. And the wifi at my hotel is giving me fits, but i’ll get there . . . gain, thanks for following. ‘…glad to be among the creatures of the earth,’ indeed! Nicely phrased.